I want to thank everyone who stood in prayer for us during the two teaching events to minister to the Shawi Indians and to the Ashenika Indians respectively. Both conferences went very well and both had a very good turn out. 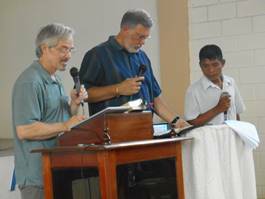 L-R: Pastor Jim, BJ translating into Spanish and Pastor Alberto translating into Shawi. I especially want to thank Jim Bethany and his team from Richland Baptist Church in Fredericksburg, Virginia for coming to minister to the Shawis through teaching on the subject of deliverance from demonic oppression. It was a much needed teaching followed by much needed prayer. Each night the team of 12 people divided into groups of three or four and prayed for everyone that wanted ministry. I am so blessed to say that although Shawis are typically very shy about stepping forward, in this instance everyone that attended came forward to receive prayer. One man in particular named Herman, who came with his family to attend the conference, also came forward for prayer. What made this so special was that Herman is a witch doctor and is not a Christian yet. His wife was not a Christian either but she also came forward to receive prayer and then received Jesus as her Lord and Savior! Herman is the Apu or spiritual leader of his village named New Jerusalem, which is made up of his children and their families. 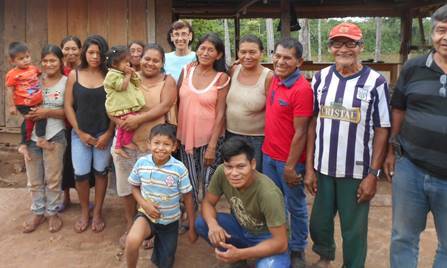 I mentioned in a prior news letter that Nilton, who is training to be the pastor of our first church plant of San Francisco, visited this village several times to talk to them about the Lord. Later he and some others from the church of San Francisco also visited to do church services and one by one the families came to know the Lord as their Savior…all except Herman and his wife Antonia. At Nilton’s request Maria and I visited the village as well to present the Gospel. On one particular visit Antonia told Maria in Shawi through tear-filled eyes how grateful she was that we came to share with her about the Lord because she knew that we both traveled quite a distance from our homes to be with them. Through the continued visits and tons of prayer for this village Antonia’s heart became more and more open to the saving grace of Jesus Christ as her children’s had been and so during the conference she invited Jesus into her life to be the Lord and Savior. Over time as the families of this village became Christians Nilton asked them if they wanted to form themselves into a church and they heartily agreed and so now we have two churches on the Shishinahua River. This is huge because in the 23 years since San Francisco existed they have never a church in their village and to my knowledge, since I’ve been working on this river from 2007, there has never been a Born Again church on the entire river either. I tell you this so that you know that your faith in what you are praying for concerning this village has become sight! Together, as we have been led by the Holy Spirit, we took ground from the enemy and established the Kingdom of God in its place! This is truly glorious! Nilton assured me that although Herman did not accept the Lord at the conference he was well on his way since his whole family did and he can see the difference in their lives. He will, of course, have to lay down his practices and submit to God but what a small price to pay to be free forever. Please join me in continuing to pray for Herman and his small village to grow strong in their faith and understanding of what Jesus did for them and that they will be witnesses to others of what He can do for them as well. Some of the attendees from the second conference. The man in the red shirt is the pastor with his wife next to him and son squatting in front of him in the Army green shirt. Maria sharing a powerful experience she had at the end of which every person wanted to rededicate their lives to Christ. The theme of the second conference, with the Ashenika Indians, was on The Power of Prayer and the turnout was very good. 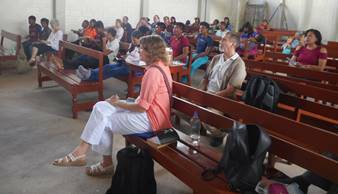 Pastor Gilver invited people from several neighboring villages to attend and thankfully they came. The material is from the Bible institute that my mission, Go To Nations, has developed to train local people to become pastors or church leaders and has been very successful in several countries. This was the course that we just finished in the Bible institute that we are doing for the village of San Francisco and so I thought it would be very useful to do it for this event as well. Pastor Gilver has a passion to see the neighboring villages of his area saved and walking strongly with the Lord. He has often gone to these nearby communities to share the Gospel and invite them to church and because of this many have accepted the Lord and are growing in their faith. This course on The Power of Prayer fit so easily in what Pastor Gilver is doing among his people because it instructs them how to pray, what happens when they pray and what is their authority to pray. We practiced some of the techniques in the course, such as praying from the Bible, so that everyone can understand the power of the Word and how to use it effectively. It was a very enriching time and I could see that people were really trying to receive from it. On the second day I asked Maria to share the life-changing experience she had last year where she died and came back to life. There was no medical examiner that could confirm this but according to her family she was not responding and not breathing for an hour. During this time though Maria saw her spirit leave her body and she was able to see it as it was lying there. She said she tried to get back into it but her hands went right through her body. She eventually was taken on two paths that the Lord describes in the Bible as the wide road, where most people go, and the narrow road where few people go. She was led on the wide road first and heard horrific cries from men, women and children of every nationality from hell begging for help and mercy from the Lord. The young boy that was leading her said that she has family members there, namely her grandparents and aunts, and family members still living that do not know the Lord. He told her that they will come here too if they do not repent. She was then taken on the narrow road which leads to heaven and it was beautiful with vibrant colors. As she got closer to the “end” of the path which led to the entrance of heaven she saw a brilliant light in front of her but could not see any facial features but she knew it was the Lord. She heard Him say that it was not time for her to come here yet but that she must go back and tell her family that they must repent before it’s too late. She said that the boy then took hold of her shoulders, turned her around to go back and, in an instant, she was back. She woke up to find her family all around her crying and terribly upset. 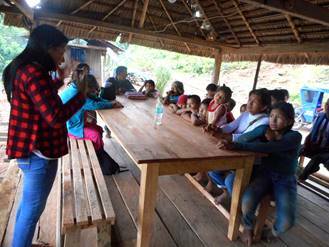 She told them all about what she saw and every one of them rededicated their lives to Christ or accepted Him for the first time. When she told this experience to the people at the conference every person there had the same response as well. The last day of the conference we prayed strongly for each person and everyone could sense the presence of the Lord. It was a very good time together and we will continue to minister to this area as time permits. I want to thank you all so much again for your faithful prayers and all the other ways you support this ministry. God is truly moving and transforming people’s lives and we, as the Body of Christ, have the privilege of being a part of it!